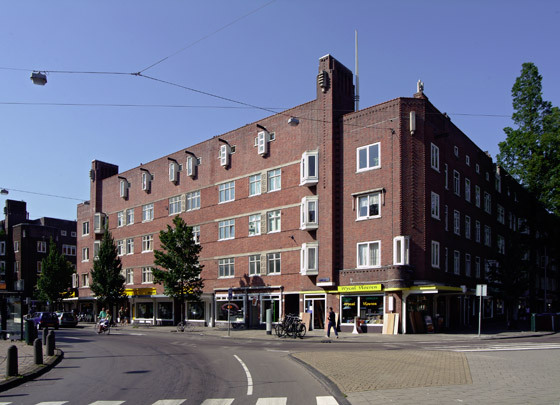 This square (Hoofddorpplein) in Plan West served as a springboard for private building in that area. Van der Mey was responsible for its facades alone, each being treated differently, the resulting arrangement of windows providing a constantly shifting horizontality. These horizontal lines are kept in check by slender verticals which also vary in form per facade. The square's west wall on axis with Hoofddorpweg once sported a sleek bell-tower (now demolished).